The stunning and unique purple eggplant is also a powerhouse of nutrition! It contains phenolic acids, or polyphenols, which are disease-fighting antioxidants. Evidence shows these phenolic acids help your body to fight against the oxidative damage that causes diseases like heart disease and cancer . Eggplant is also a good source of potassium, which helps lower blood pressure [2,3]. It also contains a hearty amount of the important minerals manganese and copper. Like most other plant foods, eggplant is a great source of fiber. Unfortunately, Americans get an average of half the recommended daily amount of fiber . The fiber from eggplant and other fruit and vegetable sources has excellent health benefits. Fiber can help lower blood sugar, cholesterol, and reduce the risk of certain cancers among many other benefits . Eggplant originates in Asia and still grows wild in parts of India, Burma, Thailand, Vietnam, and others . The name “eggplant” dates back to the British occupation of India where the white version was popular. In France and most of Europe it is referred to as the “Aubergine”. Some historical texts from as far back as 300 B.C.E. mention the eggplant and its use in food and medicine . Some texts show its ancient uses for diabetes, asthma, and other ailments. 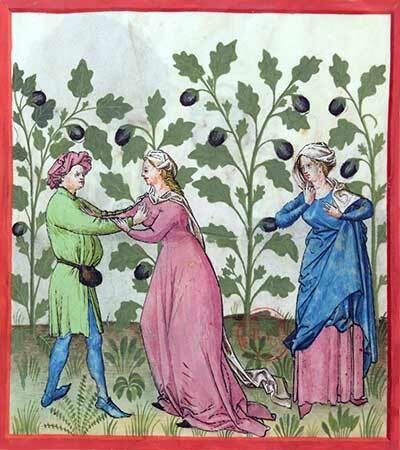 There are even paintings and drawings of the eggplant from medieval period artists! If the eggplant will not be eaten within two days, it should be refrigerated. When refrigerating, the eggplant should be wrapped in a paper towel and placed in a reusable container . Here, it can be stored for about 5-7 days. When choosing eggplants in the store or farmers market, pick ones that are firm and heavy for their size. Choose them with firm shiny skin, free of soft spots. Goleniowski M, Bonfill M, Cusido R, Palazón J. Phenolic Acids. In: Natural Products. Berlin, Heidelberg: Springer Berlin Heidelberg; 2013:1951-1973. doi:10.1007/978-3-642-22144-6_64. Food Composition Databases Show Foods — Eggplant, raw. https://ndb.nal.usda.gov/ndb/foods/show/301855?manu=&fgcd=&ds=&q=Eggplant, raw. Published 2018. Accessed July 23, 2018. Cappuccio FP, MacGregor GA. Does potassium supplementation lower blood pressure? A meta-analysis of published trials. J Hypertens. 1991;9(5):465-473. http://www.ncbi.nlm.nih.gov/pubmed/1649867. Accessed July 23, 2018. Increasing Fiber Intake | Patient Education | UCSF Medical Center. https://www.ucsfhealth.org/education/increasing_fiber_intake/. Accessed July 23, 2018. Otles S, Ozgoz S. Health effects of dietary fiber. Acta Sci Pol Technol Aliment. 13(2):191-202. http://www.ncbi.nlm.nih.gov/pubmed/24876314. Accessed July 23, 2018. Daunay M-C, Janick J. Chronica HORTICULTURAE A PUBLICATION OF THE INTERNATIONAL SOCIETY FOR HORTICULTURAL SCIENCE. History and Iconography of Eggplant. ; 2007. http://www.globalhort.org. Accessed July 25, 2018. Eggplant | Sweetwater Organic Farm. http://sweetwater-organic.org/veggies/eggplant/. Accessed July 23, 2018.